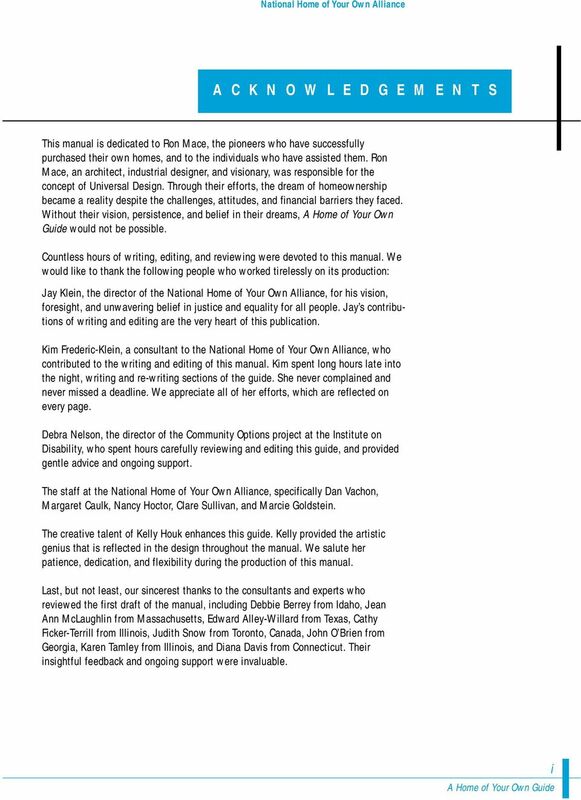 Download "National Home of Your Own Alliance A HOME OF YOUR OWN GUIDE"
2 The National Home of Your Own Alliance, established in 1993 at the University of New Hampshire s Institute on Disability, is a national technical assistance center and clearinghouse that focuses on homeownership and control for people with disabilities. The Alliance was created by a five-year cooperative agreement with the United States Department of Health and Human Services Administration on Developmental Disabilities. Twenty-three states receive ongoing support from the Alliance to develop pilot projects of homeownership. 9 P R E F A C E There is in the world today a vibrant new culture. It is young and rough, but its birth has been true, and with proper nurturing, its life and growth promise to be dramatic. It is the culture of inclusion. 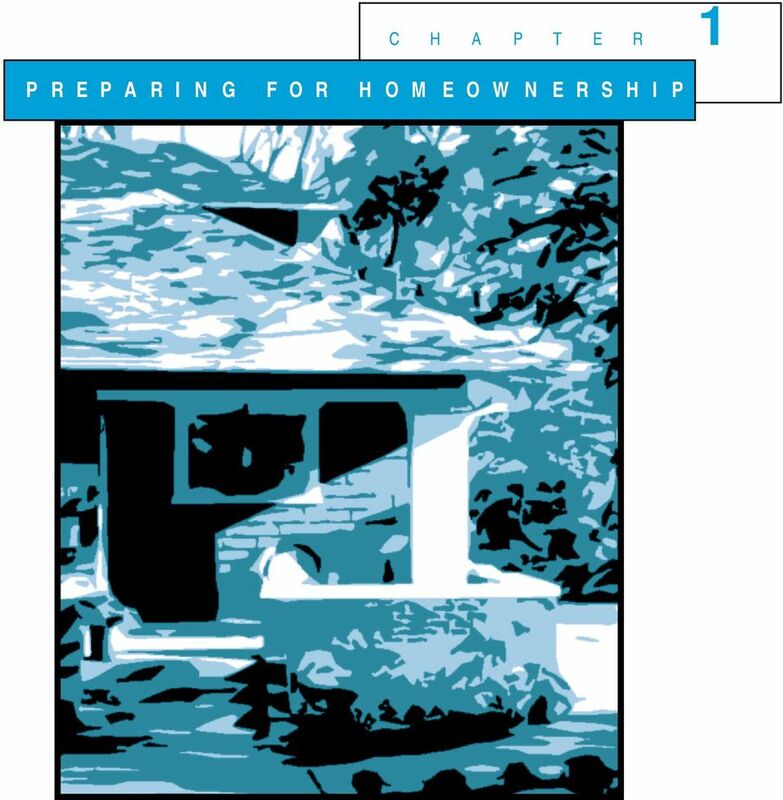 Judith Snow, (1992 p.vi) 1 Owning a home has always been and continues to be the American dream. 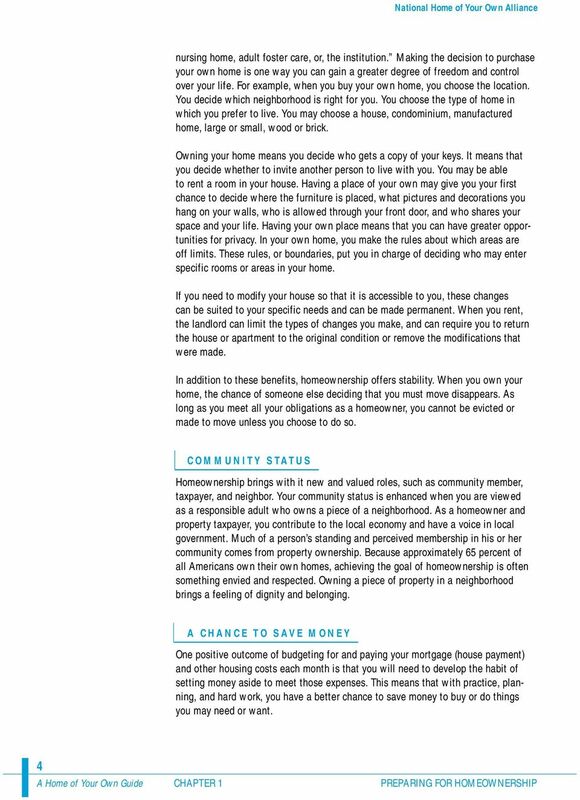 For people with disabilities and others who have been denied the opportunity to choose where and with whom they live, the dream of owning a home is either rarely considered or typically discouraged. 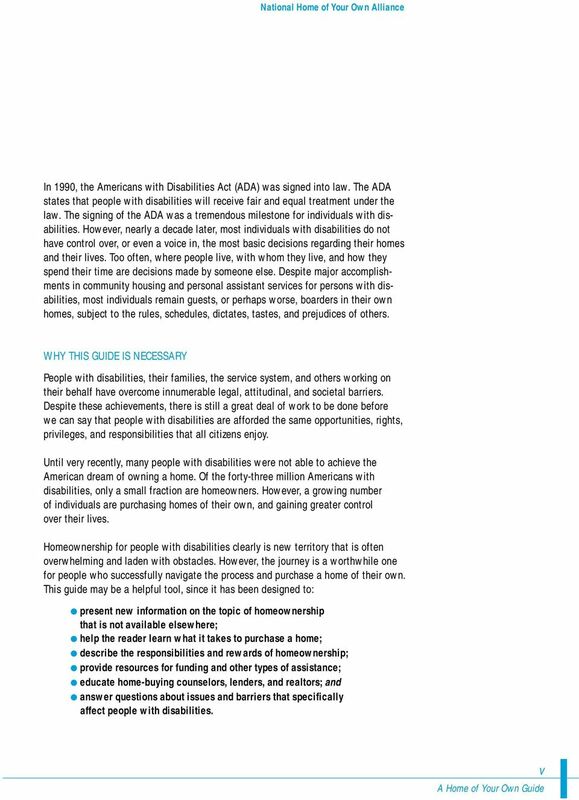 This guide reflects a new vision for people with disabilities, as well as the housing industry that has begun to serve them. 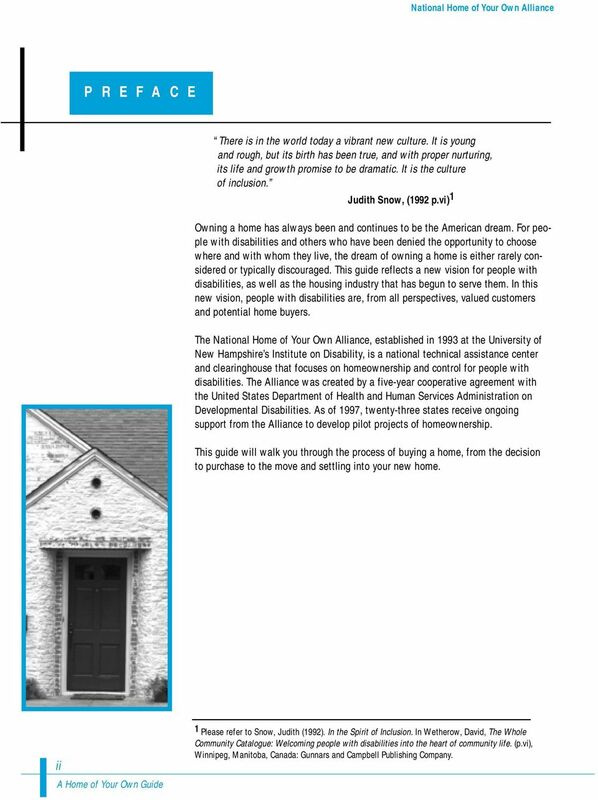 In this new vision, people with disabilities are, from all perspectives, valued customers and potential home buyers. 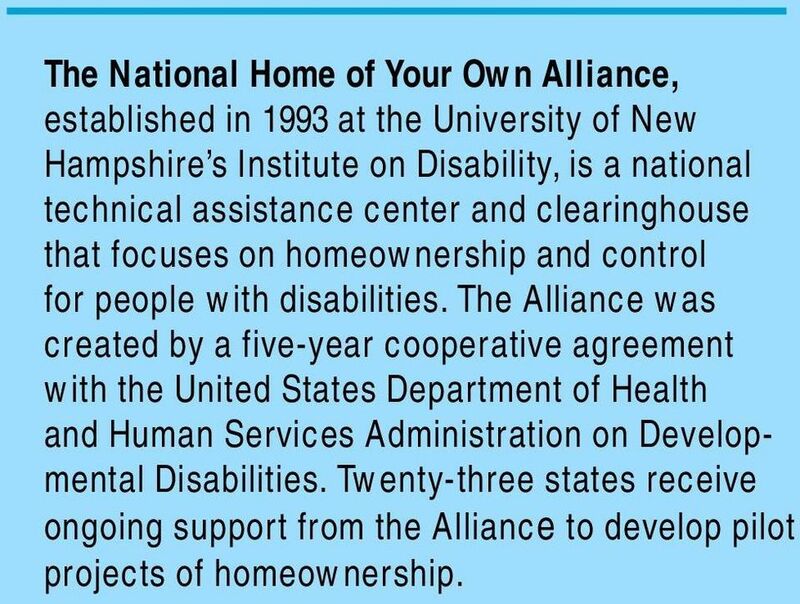 The National Home of Your Own Alliance, established in 1993 at the University of New Hampshire s Institute on Disability, is a national technical assistance center and clearinghouse that focuses on homeownership and control for people with disabilities. The Alliance was created by a five-year cooperative agreement with the United States Department of Health and Human Services Administration on Developmental Disabilities. As of 1997, twenty-three states receive ongoing support from the Alliance to develop pilot projects of homeownership. 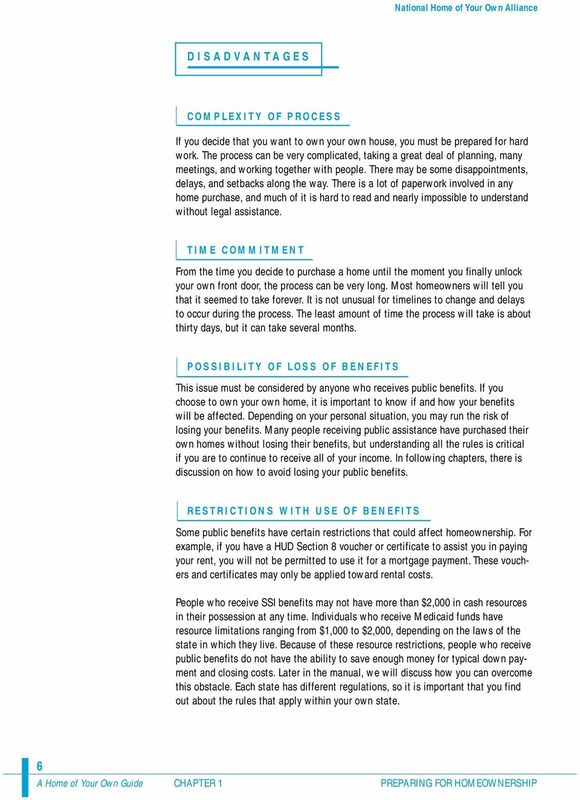 This guide will walk you through the process of buying a home, from the decision to purchase to the move and settling into your new home. ii A Home of Your Own Guide 1 Please refer to Snow, Judith (1992). In the Spirit of Inclusion. 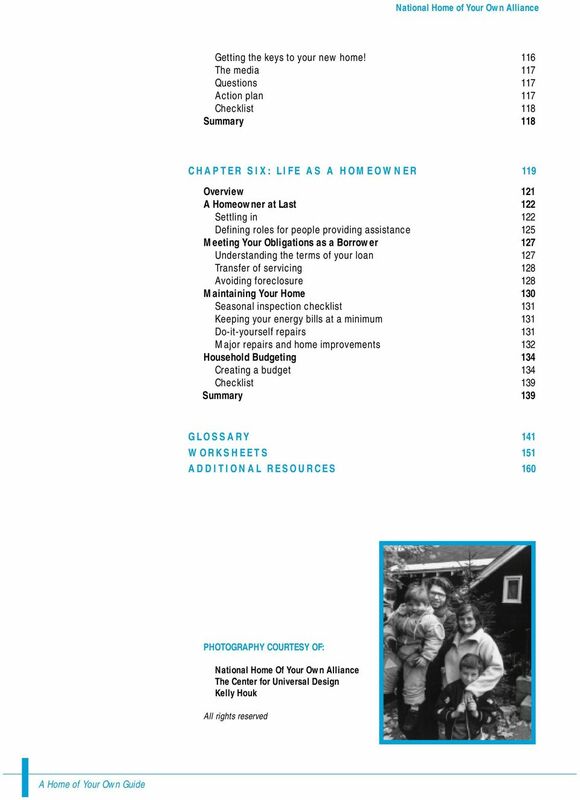 In Wetherow, David, The Whole Community Catalogue: Welcoming people with disabilities into the heart of community life. (p.vi), Winnipeg, Manitoba, Canada: Gunnars and Campbell Publishing Company. 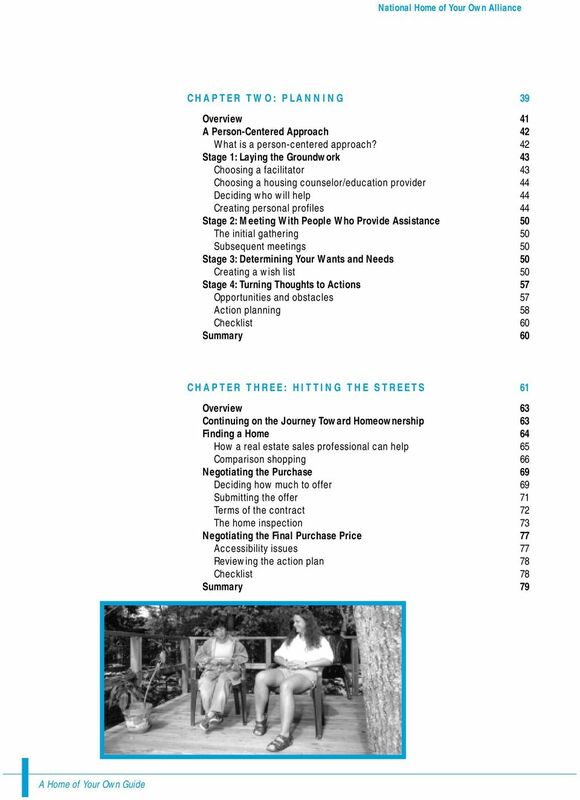 13 MAKING THE BEST USE OF THE GUIDE Purchasing a home is a complicated undertaking for anyone. Most people only buy one or two houses in a lifetime! Working successfully with lenders, realtors, and other important people in the process requires a basic understanding of information ranging from simply describing the kind of house you want, to providing technical information, to prequalifying for a loan. Therefore, for some users, this manual may seem oversimplified. For others, it may seem too difficult to understand. Still others may find some chapters easy and others more difficult. 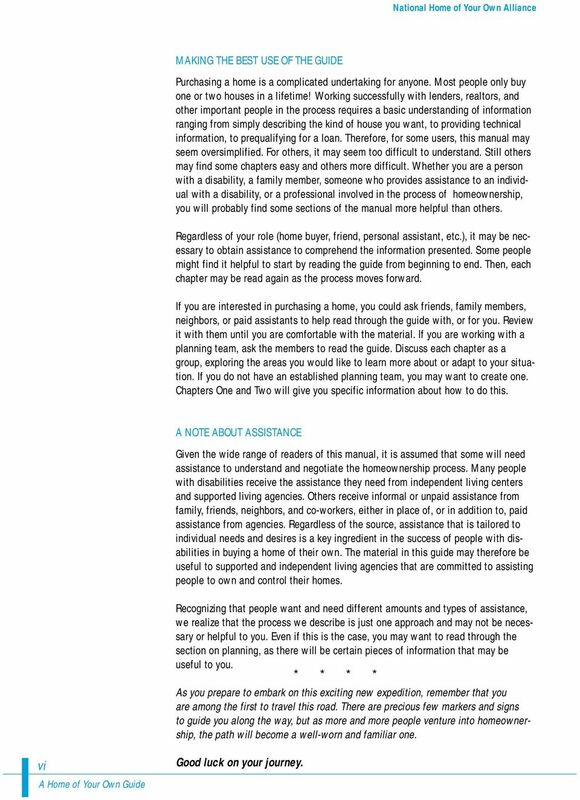 Whether you are a person with a disability, a family member, someone who provides assistance to an individual with a disability, or a professional involved in the process of homeownership, you will probably find some sections of the manual more helpful than others. Regardless of your role (home buyer, friend, personal assistant, etc. ), it may be necessary to obtain assistance to comprehend the information presented. Some people might find it helpful to start by reading the guide from beginning to end. Then, each chapter may be read again as the process moves forward. 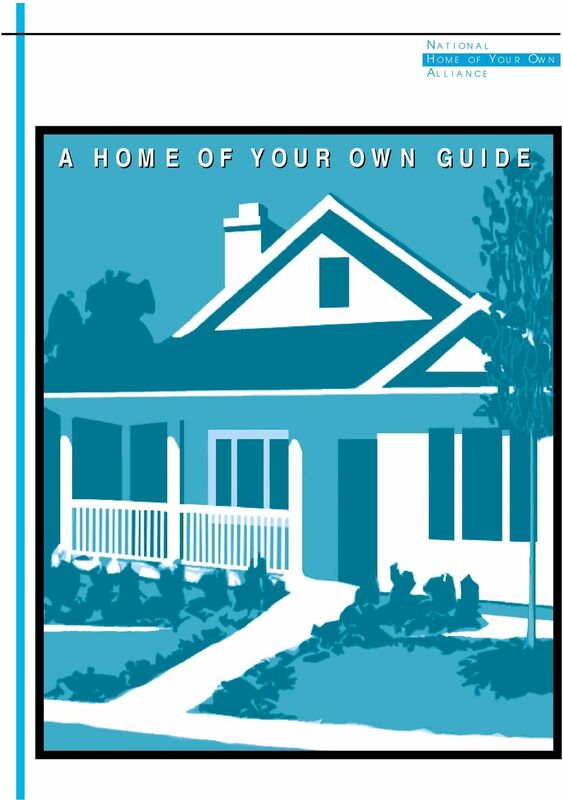 If you are interested in purchasing a home, you could ask friends, family members, neighbors, or paid assistants to help read through the guide with, or for you. Review it with them until you are comfortable with the material. 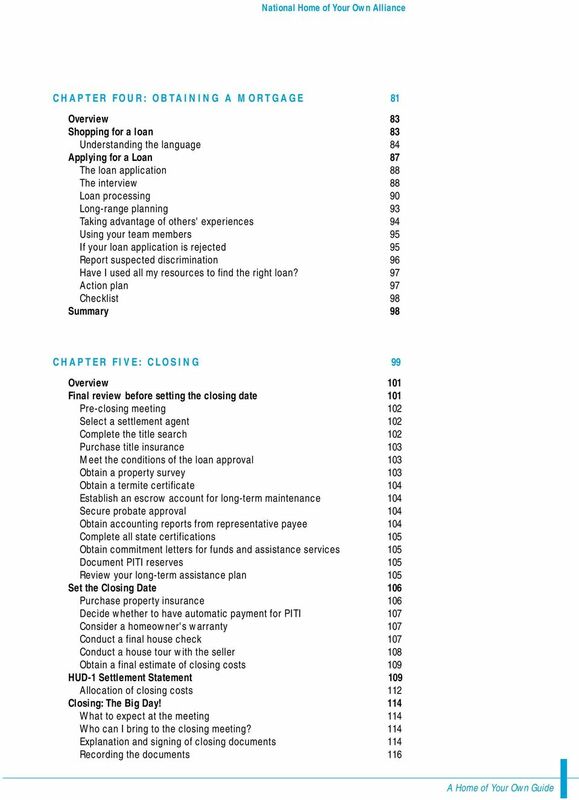 If you are working with a planning team, ask the members to read the guide. Discuss each chapter as a group, exploring the areas you would like to learn more about or adapt to your situation. If you do not have an established planning team, you may want to create one. 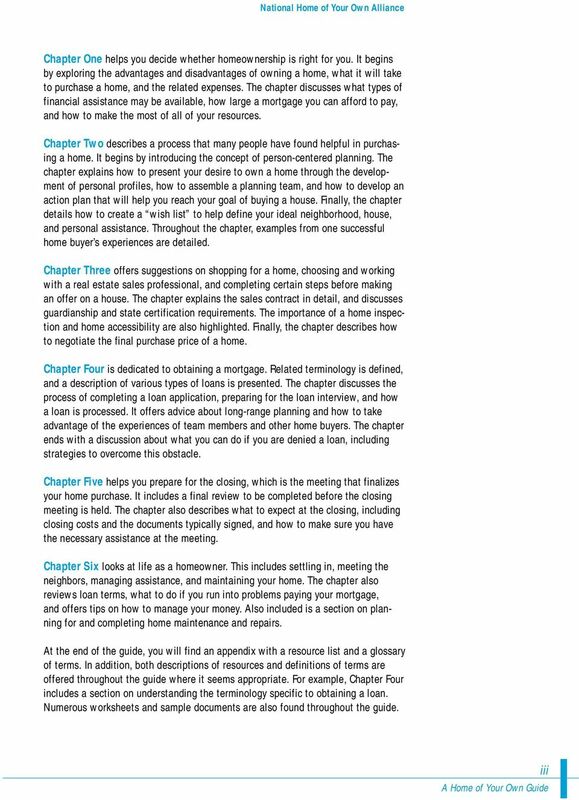 Chapters One and Two will give you specific information about how to do this. 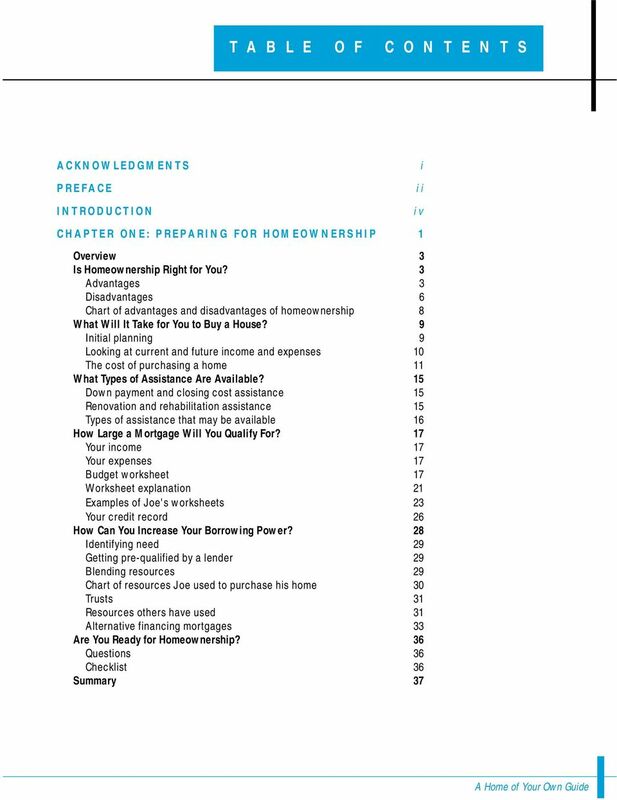 A NOTE ABOUT ASSISTANCE Given the wide range of readers of this manual, it is assumed that some will need assistance to understand and negotiate the homeownership process. 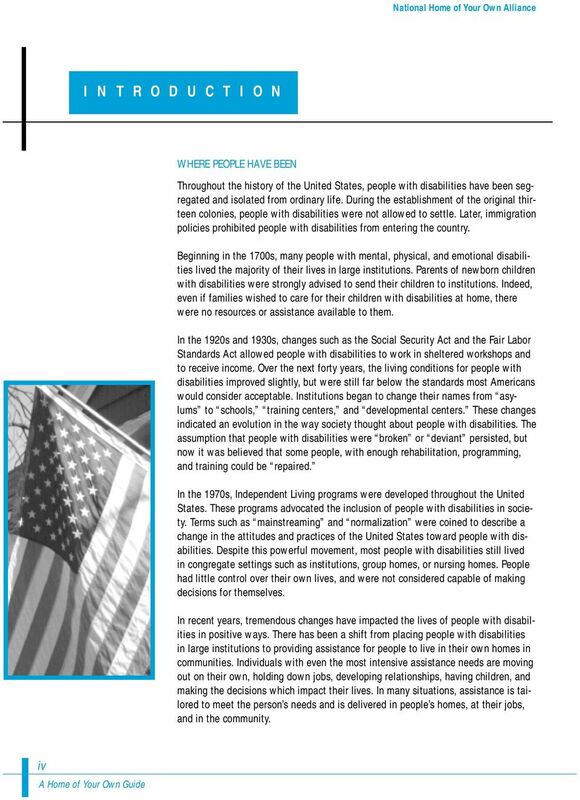 Many people with disabilities receive the assistance they need from independent living centers and supported living agencies. Others receive informal or unpaid assistance from family, friends, neighbors, and co-workers, either in place of, or in addition to, paid assistance from agencies. 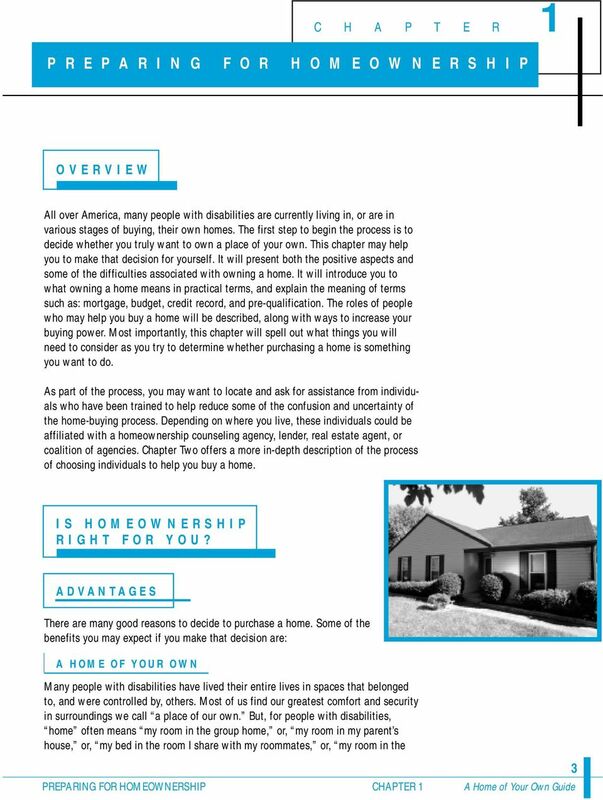 Regardless of the source, assistance that is tailored to individual needs and desires is a key ingredient in the success of people with disabilities in buying a home of their own. 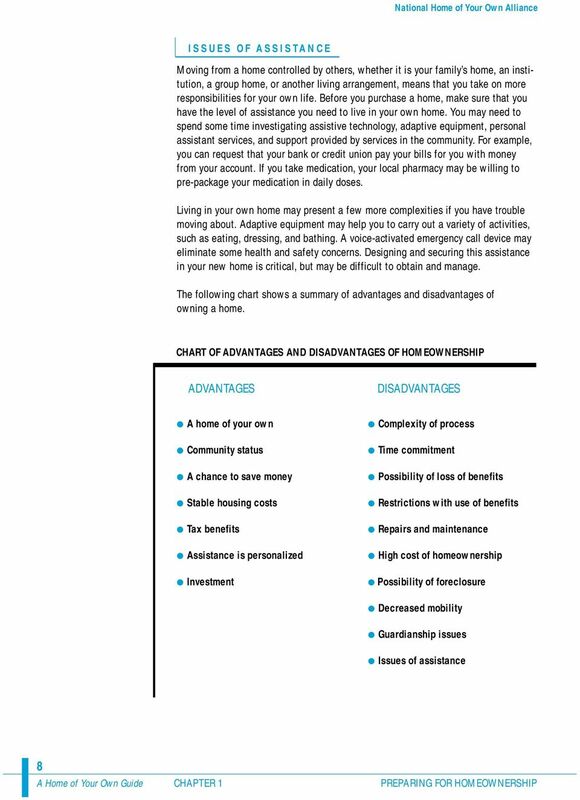 The material in this guide may therefore be useful to supported and independent living agencies that are committed to assisting people to own and control their homes. Recognizing that people want and need different amounts and types of assistance, we realize that the process we describe is just one approach and may not be necessary or helpful to you. Even if this is the case, you may want to read through the section on planning, as there will be certain pieces of information that may be useful to you. * * * * As you prepare to embark on this exciting new expedition, remember that you are among the first to travel this road. There are precious few markers and signs to guide you along the way, but as more and more people venture into homeownership, the path will become a well-worn and familiar one. vi A Home of Your Own Guide Good luck on your journey. The majority of Canadians own their homes, and the number keeps growing. But some people believe they could never own a home. 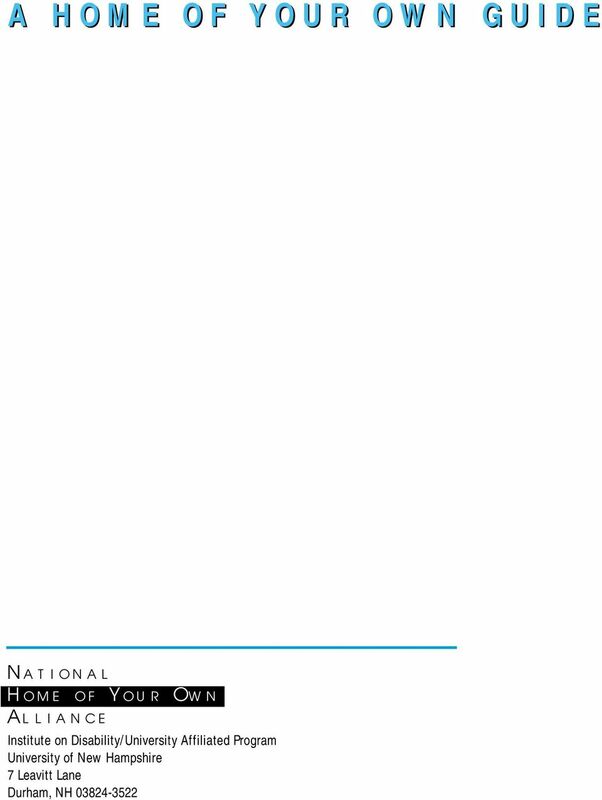 Copyright 2006 by the National Foundation for Credit Counseling. The first steps when you buy a home Do you think you want to buy a home? 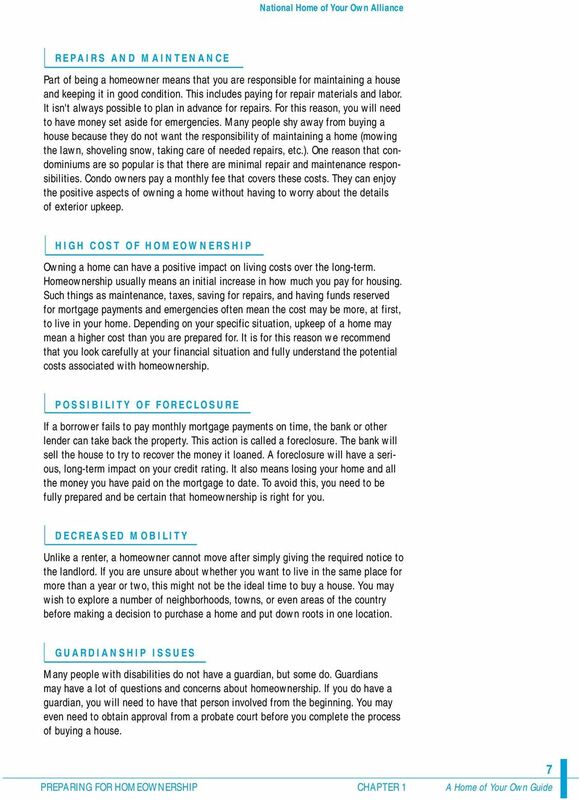 There are lots of things to think about before you make up your mind to buy a home. Are you ready to take a big step like this? We ll help you open the door. A consumer s guide to owning a home with less than three percent down. 3 % WITH A LOW DOWN PAYMENT or less HOW TO BUY A Home If you re dreaming of buying a home, congratulations. You re in good company! 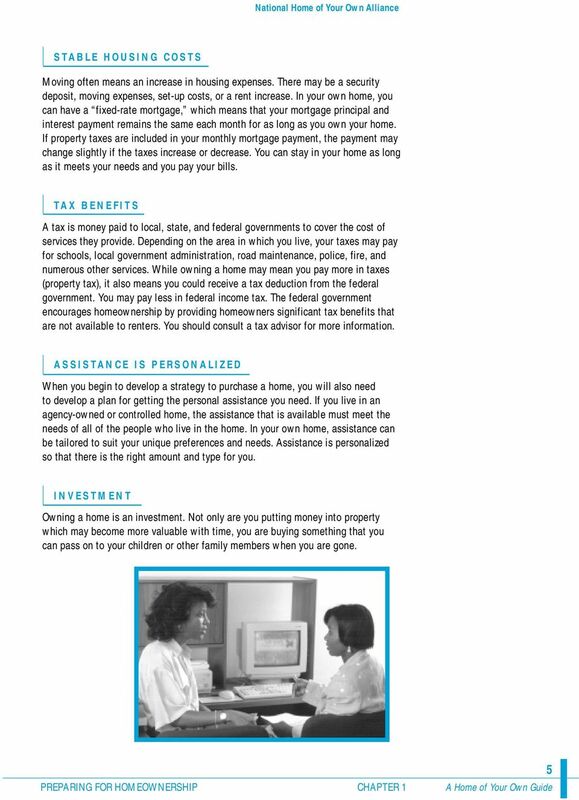 101 EVENT KIT THE HOME BUYING START LIVING HOMEBUYER. Congratulations!